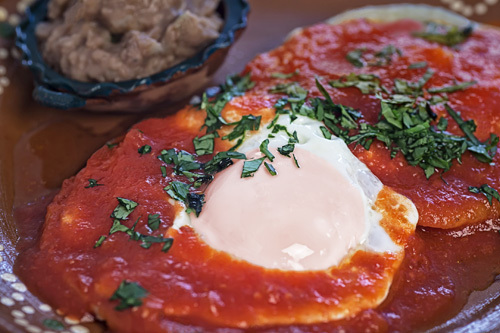 It is said that the ranch style eggs were the daily breakfast of the Mexican laborers, who worked at the ranches and curiously it ended up becoming Mexico’s classical breakfast. Such was its popularity that it rapidly came out from the Mexican borders, thus becoming a very famous dish also in the U.S.A. This spectacular dish, in fact is very simple, it only consists of 2 fried tortillas (they don’t get to be tostadas ) over which 2 sunny side up eggs are put. To finalize the eggs are covered with a very special red salsa and coriander is sprinkled over all the dish. It is a delight to taste all these ingredients together! This dish can be accompanied with refried beans , a little bit of fresh cheese and tortilla chips or with your favorite appetizer. In this recipe there are many steps to follow, therefore follow them carefully so your ranch style eggs will be a success. Since eggs are going to be fried in this recipe, we recommend using a frying pan specialized in frying eggs so they won’t stick. Although some salt can also be put in the frying pan when the eggs are fried, this helps them not to stick. In this recipe tortillas are also going to be fried and a vegetable oil will be needed since the olive oil is not good to fry dough. This recipe serves 1 plate. Pour in a frying pan approximately 1/2 cup of vegetable oil, so you end up having approximately a .4’’ deep oil layer. Take 1 corn tortilla with some tongs, dip it in the frying pan oil and fry it for about 7 seconds per each side, until it is lightly fried. Don’t leave the tortilla in the oil for a long time because it will become tostada and it will no longer be useful. Repeat the same procedure with 1 more tortilla, it won’t be necessary to add more vegetable oil. Transfer from the paper towels to a plate, with the tongs, the 2 tortillas that were fried and place them a bit spread, then set aside. Heat in a saucepan over high heat 1 tablespoon of olive oil. When the salsa boils reduce to medium heat and cook it for about 3 minutes, until it thickens a little and it gets an intense red color; stir occasionally. Then set aside. Heat in another frying pan over low heat 1 tablespoon of olive oil. Crack 1 egg and pour it in the frying pan. Be careful, try not to break the yolk so the dish has a better presentation. Fry the egg that was put in the frying pan for about 2 minutes, until it is well cooked. While the egg is fried pour some of the oil that is in the frying pan over the egg so it fries better. Transfer from the frying pan to the plate, where the tortillas are, the egg that was fried and put it over 1 of the tortillas. Then set aside. Repeat the same procedure with 1 more egg, it will be necessary to add more olive oil. Finely chop 1 coriander sprig and reserve. Pour the red salsa that was prepared over the eggs that were cooked. Sprinkle over the ranch style eggs the coriander that was minced. * This is a curious fact ... we have seen this dish served with sincronizadas instead of tortillas and we have doubts. Variation: Now try the version of Mexican style eggs. Did you like the Ranch Style Eggs? ‣ Try the Mexican Pastas. ‣ Know the Mexican Soups. ‣ Don’t miss a Mexican Dessert. In order to fry well your tortillas, use some good tongs like this ones. They have a good grip, they grab very well the food and they are of good quality. The “Don Enrique Guajillo Peppers" are the best that there are. They have a very good taste, a divine red color and they give a lot of flavor to the food. The “Corn Tortillas La Banderita" are excellent for this recipe because they have a very good taste and they fry very well.